Hareraiser was a game based on the book Masquerade, and was sold with the aim of gamers trying to win a prize. 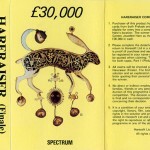 A final game was produced called “Hareraiser – Finale” where it would help you solve the first puzzle and then help you progress to hopefully win a Golden Jewelled Hare or £30,000. But the C64 version has been very much at large – and we’re wondering if it was ever actually completed (the first edition does exist). 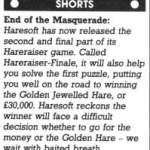 In 1989, Commodore User magazine had a quick news item to say that Haresoft had gone under and the assets sold off. 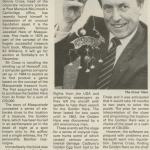 So quite possibly the C64 version didn’t quite make it before the company went under. See gallery for the news item on this. Well, in 2013 – Mat (Mayhem) Allen won an auction for both the games in the series for the C64, which confirms that the sequel was infact released – but just in very very limited numbers. Once Mat has confirmed the preservation of the game, we will close the case on the game. 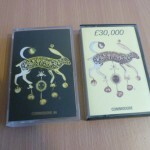 Photo added of auction photo showing the C64 game. Fingers crossed the tape still works!